Welcome to the last epic installment of our visual and storytelling StraightTalk series, in which we explore the power of story. We know that in order to succeed as business architects, it’s not just about creating architectures and ideas for the future – we also need to convey those ideas, influence others, and incite action. Enter storytelling. We spoke with a master storyteller, guest star Tamara Park, who is an award-winning television producer and documentary director who captures stories on five continents. She is also co-founder of StoryNow, a media tech company that leverages a unique app and platform that is designed to help corporations and nonprofits support the power of video storytelling. In her recent podcast, Tamara gives us the straight talk on why story matters, how to tell a story, and the role of the business architect within an organization’s story. This podcast is magical and you’ll see the role of a business architect with completely new eyes after you listen to 15-Minutes with Tamara Park: How Business Architecture Practices Can Leverage Storytelling For Greater Success. This installment also features an extra special surprise: an animated video created by another master storyteller and previous StraightTalk guest star, Dr. Raj Ramesh, on how business architects can master the art of storytelling and explaining complex business topics. Let’s get started on this journey. First, why is good storytelling so important? If the message and content are good, why isn’t that enough? Tamara: “Story has the power to gain our attention, which is a rare commodity these days. It’s how we best learn, it helps us to remember and can even compel us to act – especially considering that business architects are so interested in transformation. There are some really fascinating statistics coming out about the power of story. For example, when someone reads text, they tend to remember 10% of a message, but when they are taken up into a story, especially a video story, they can remember 95% of a message. Why is the concept of story so important for business architects? Tamara: “I am so excited to see business architects really embrace the power of story for two reasons. First, I see business architects being central to the role of story – it can really fuel a business architect’s identity. I see business architects playing a vital role as the guide within an organization’s story, to create order out of chaos to help take the organization from a problem to be solved or a goal to be chased, to action, success, and transformation. Tamara: “Let me briefly walk you through story structure. As we explore how story structure relates to the discipline of business architecture, I invite you to enter the story in the role of the guide and consider the protagonist (a.k.a. hero) as your organization. Context/Opening Scene – In the first moments of a story, we discover the world of the protagonist. Business architects use their skilled curiosity and keen powers of observation to understand the culture of organizations. Status Quo (a.k.a. Stasis) – This is the survivable reality that the protagonist is currently experiencing. Business architects understand and reflect the specificities of the status quo to equip organizations in decision-making when the challenges mount. Inciting Incident – This stage represents disruption. (And there’s no story without disruption.) Something happens that causes the protagonist’s reality to shift (or even implode) and it can never go back to the status quo. Business architects often enter the scene because of a disruption – or they bring disruption as they guide change. It is important to recognize here that an organization’s equilibrium has been lost. Quest – The Inciting Incident sets the protagonist on the quest. This is the hero’s journey to solve a problem or chase a goal. Energy is invested in trying to create a new equilibrium. Business architects help organizations clearly articulate what they are going after from the very beginning. Conflict – This is the core of the story and the longest piece – the messy middle – where the protagonist encounters one challenge after another that try to block them from reaching the desired goal. Desire defines the story, but conflict drives the story. Challenges and conflict reveal two things: 1) The true character of the protagonist, or in psychological terms, the difference between the true self and false self (i.e. what the organization says it’s about versus what it’s really about demonstrated by its actions and culture). 2) How much the protagonist desires the goal. To overcome great challenges, you need to have a great goal and desire. Organizations can have external goals (e.g. growth, effectiveness, etc.) but it’s becoming increasingly critical that they have internal ones as well (e.g. social impact, sustainability leader, values-driven culture, etc.). Business architects help organizations navigate the messy middle and create order out of chaos. They also help an organization remember the goal and the WHY. Keep in mind that conflict is the biggest part of every story and likely the most vital part of your job. The Choice – As a character moves towards the end of the story, there is a dark night of the soul, a sense that all is lost. This is where our hero faces The Choice, a critical decision point where the protagonist must decide if they are All In. In great stories it’s never simply a choice of good or evil. It’s either two good choices or two bad ones, but it’s always tough. All great stories are about transformation, so what is required is for the protagonist or organization to go all in. Business architects help organizations make excellent decisions, even when they are in the throes of change. Climax – Following The Choice, we reach the reality that is either a grand success or spectacular failure (often with lots of learning). Business Architects help organizations understand the stakes from the beginning and navigate through challenges. However, it is up to the organizations to make the choices, leading to their own successes or failures. Denouement – The little moment at the end of story to make sense of it. This is the happily ever after or the tragic end. While this is the shortest part of the story, it’s vital because it helps the audience take in the fullness of the story – to savor it or be stunned by it. Business architects help organizations pause to assimilate their own story, to celebrate the success or soak in the lessons of failure. And here’s a diagram that summarizes this journey with a really cool illustration. Download and enjoy. What can we learn from other business architects? Business architects research, understand, synthesize and model a lot of information about business and technology. But how do we distill all of that into a story we can tell? How do we explain complex topics to senior executives and other stakeholders? How do we craft compelling pieces? Dr. Raj Ramesh has created a captivating animated video where he shares some of his experiences and what has worked for him — It’s storytelling on storytelling. Whoa, meta! He also gives you ideas for how you can play to your own strengths and what comes naturally to you in order to craft stories in your unique way. Make sure to check out How to Master the Art of Storytelling by Dr. Raj Ramesh. It is some of the best 5 minutes and 28 seconds you’ll spend today. Tamara: “As kids, we fall in love with story. I encourage you all to play with story and think about it, and have fun. Embrace your role as the guide, but also just let yourself fall more in love with story – and consider your own story in the transformation. 15-Minutes with Tamara Park: How Business Architecture Practices Can Leverage Storytelling For Greater Success (StraightTalk podcast): Just in case you missed that link right there in the beginning, make sure to check out Tamara’s podcast where she discusses the power of story and how to tell a good one, which was the basis for this post. 40 Days of Story: Let’s Wander, Wonder Together (Blog by Tamara Park): Story is not just for communicating with and influencing others. As Tamara reminds us, individuals can leverage the power of story to help with personal transformation and healing. Take a 40-day journey with her to explore your own story, in just a few minutes a day. 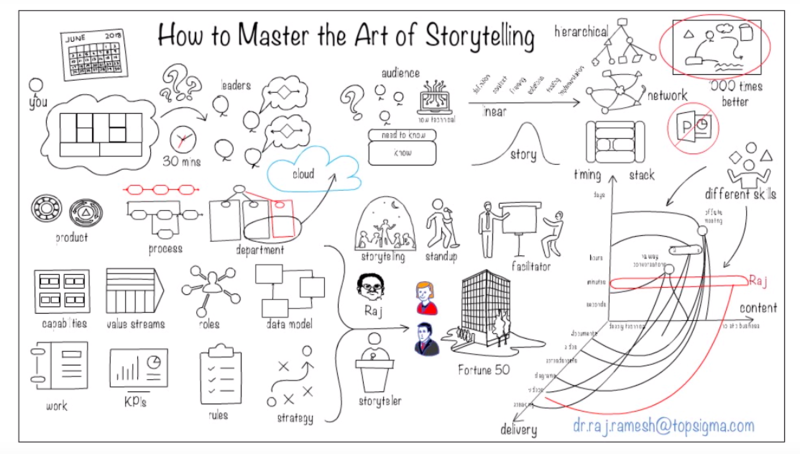 How to Master the Art of Storytelling (Dr. Raj Ramesh on YouTube): An animated video on how to master the art of storytelling, from the storytelling master, Raj Ramesh. He’s brilliant at turning complex topics into simple, visual, compelling and actionable messages. P.S. Just in case you missed it, make sure to check out Raj’s StraightTalk podcast on Business Architecture and Artificial Intelligence. Illuminate: Ignite Change Through Speeches, Stories, Ceremonies and Symbols (Nancy Duarte and Patti Sanchez): This visual and accessible communication guidebook will show you how major organizations have mobilized people to embrace bold changes. To envision the future is one thing, getting others to go there with you is another. Don’t miss these other books and resources by presentation guru Nancy Duarte as well. Resonate: Present Visual Stories that Transform Audiences (book by Nancy Duarte): How to make a strong connection with your audience and lead them to purposeful action – and convey content with passion, persuasion and impact. slide:ology: The Art and Science of Creating Great Presentations (Nancy Duarte): A must-read, highly useful guide with practical approaches to visual story development. This one is a classic. The Blog (Nancy Duarte): Amazing resources and blog from Nancy Duarte. The Power of Myth (Joseph Campbell): An oldie but a goodie. Check out this timeless six-part conversation with Bill Moyers and mythologist Joseph Campbell on the hero’s journey. The full series is available through various streaming services such as this one here. How to Tell a Story (TED Talk Playlist): An amazing collection of TED Talks about the craft from storytelling masters. The Stories We Choose To Live (TED Talk): A thoughtful TED Talk by Michael Margolis on how you can take ownership of your story and be the master of your destiny.